My husband has wanted a smart deadbolt since he saw one on This Old House a few years ago. I resisted that request till now. With other Nest devices in the house, I thought I try out the long-promised Nest x Yale Lock. Pricing for the smart deadbolt starts at $249, but it needs a Nest Connect or Nest Secure to integrate with the Nest App and enable remote control. If you do not have either already, there is a version including the Nest Connect, which costs $279. It comes in three different finishes: Nickel, Bronze, and Brass. Like other Yale smart locks, for example YRD256, this device is completely keyless. You have the option to create up to 20 entry PIN codes and specific entry times can be set. It includes logging, notifications, a brute force alarm and notification. The Nest x Yale lock does not rely on Wi-Fi for locking and unlocking. It communicates with the Nest Connect via the proprietary Weave protocol. PIN codes are stored in the lock. If you do not want to be disturbed or desire to disable the lock touch pad the Nest lock has a Privacy Mode feature. It can be enabled from the configuration button on the inside of the lock or from the Nest app. Bluetooth is used though during configuration but not during normal functionality. It too includes 9V terminals on the bottom if you ignore the low battery warnings. Packaged with the locking assembly and deadbolt is a strike plate, an installation guide with removable door template, mounting screws (three different sizes to choose from based on door depth), 4 AA alkaline batteries, and depending on the version purchased a Nest Connect. I installed the Bronze version with a Nest Connect. Visually I find it a sleek device that blends in well with my existing door hardware. Because I have an older home, installing the device was a bit involved. I doubt that the locking mechanisms were ever replaced on any of the doors in my house. The bore hole for my front door’s original deadbolt was about an inch, so some modifications were required to because the Nest x Yale lock requires a lock hole that is 2 1/8” and 2 3/8” or 2 3/4” deep. This is where the removable door template was semi-handy. The Nest x Yale lock is compatible with door thicknesses starting at 1 3/8”, 1 3/4”, 2” and 2 1/4”. The door template depth only accounts for a door that is 1 3/4”. My front door is on the thicker side. The bore hole guide with the template lined up on the edge of the door was helpful for centering the enlarged bore hole. I could not use the whole template at the same time. Using my hole saw kit I was able to enlarge the hole gradually to the required width of 2 1/8” and deepen the deadbolt hole. While I realize that Nest’s template guide will likely work for most home owner’s doors. How hard would it be to have a variable depth door template? This could be blocking for anyone less “handy”. Installing the strike plate also entailed a bit of carpentry — again, old home. The strike plate cut out in the door jamb was falling apart. So, I chiseled out what wood remained, cut and installed a Dutchman. On the newly filled in solid surface, bored out a new deadbolt hole and affixed the strike plate. Obviously most of my installation effort revolved around retrofitting my door and jamb to accommodate a modern lock, which took me a couple of hours to do. It might take less if you are a better carpenter than me. Or if you know that the door requires significant carpentry, you may want to hire someone for the retrofit. Once the carpentry was complete the actual Nest x Yale lock install took about 20 minutes. In the past, I have replaced internal door handles, deadbolts on other doors in my current house and previous residences with non-smart locks. Typically, the lock installation entails a bit of back and forth to line up the pins between the external and internal locks. That was not the case with this Yale deadbolt. The outside keypad slides right through the deadbolt. It is easy to attach to the inside lock mechanism. Connecting the two together with the available mounting screws. The guide specifies the correct screws to use based on door depth, so was straight forward. There was no need to jiggle the outside and inside devices back and forth or issues with lining them up. If you do not have a Nest Connect or Secure already you should step away from the lock setup for a few minutes to add the Nest Connect. 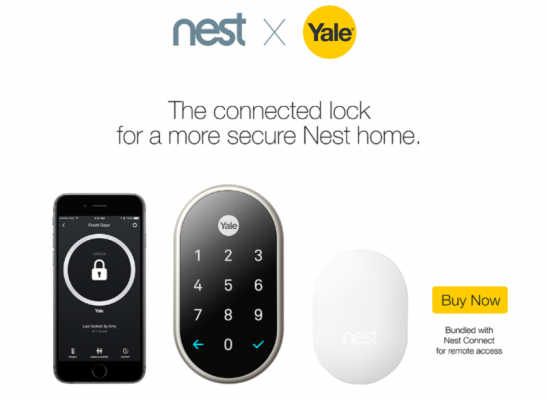 The Nest Connect will be necessary during the Nest x Yale lock configuration. If you go right to configuring the lock, it will tell you to stop and set up a Nest Connect before proceeding. Once you add the Nest Connect to your account, install the batteries in the lock, and the lock will talk you through initial pin setup and testing functionality. You can also enable \ disable privacy mode from the lock control button. After completing the initial configuration on the device, provided you have either a Nest Connect or Secure already configured on your account, you can add the lock to the Nest App. The Nest App adds layers of configurability and access to the lock. In the app you can add additional family members and configure timed entry. The app also enables expected features such as remote lock, unlock, privacy mode management, usage logging and alert pushing. Added value within the Nest App for me is the lock’s communication via Weave with my Nest Thermostat. It adds another communication point for Home \ Away Assist, which makes my thermostat more efficient at switching its behavior. Another feature only accessible from the app that I liked is Auto-Lock. Within the Nest app the lock can be set to Auto-Lock after 10 seconds, 1 minute or 5 minutes. This is a handy failback in the event one forgets to lock the door. It will lock after a set amount of time without intervention. I like Auto-Lock but it takes me to a frustration point too. This version of Yale deadbolt is tightly integrated with the Nest world, as one might expect. It not only works with Nest. It only works with Nest. I would expect that the Nest x Yale lock, like other Nest products, would be on the Nest IFTTT channel. It is not. It would be great to integrate my Nest lock with existing IFTTT applets to string together actions. For example, only trigger the Auto-Lock if the door sensor is in a closed state. Right now, the Nest x Yale lock only integrates with Nest Secure. If you intend to integrate it with non-Nest products via an IFTTT applet, or Stringyify flow, that option, at least right now, does not exist. Also, at least currently, the lock is not voice controlled. Which means it cannot receive commands from Google Assistant. I am surprised that Nest as part of the Alphabet family could not be controlled from Google Assistant. Another possible frustration point is Privacy Mode. Privacy Mode will lock users out of using the keypad until the mode is disabled from the app, configuration button on the back of the door, manually unlocked from the inside, or unlocked from the app. If Privacy Mode is on and your phone is dead, you will need to get a hold of another family member to unlock the door for you. Interoperability gripes aside, the Nest x Yale lock works exactly as expected. Installing Nest products just work. There is no app timeout or need for multiple tries to connect to the device. The lock connected to the Nest app the first time. Controlling the lock from the app is straight forward. This is in line with smart home products that Nest releases. It is a hit with my family. My kids love being able to enter the house on their own. I do not have to worry about them loosing keys or keys being left in the door. I will add ONLY works with nest was kind of expected. Voice control is coming soon promise that :). If you do have nest alarm it is nice to be able to automatically disarm your alarm when you unlock the door and have universal codes. I agree the autolock feature is great but not so great when it locks before your kids shut the door and then shut the door ;( luckily it seems really well built and has held up to those occasional shuts. I do like the lock so much we are buying to more but to fairness we are a nest family. Thermostat, 4 cameras (one hello), protects and the nest secure. I wish nest in general had more IFTTT features it’s frustrating how limiting it can be. Nice write up! I looked at the Nest Secure. I find it pricey for what it offers. At least for now too pricey to replace my current smart alarm system. I hear you about being a Nest family. My house is well on the way; Nest Thermostat and multiple Protects. Hopefully, Nest will expand IFTTT channel options in the near future.